Married radio stars Kitty (Grable) and Jack (Dailey) Moran want to have a baby. After Kitty miscarries, the couple moves to television and tries to adopt a baby. 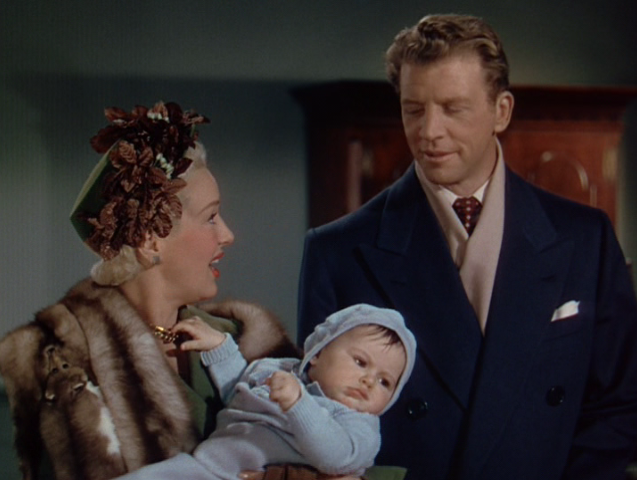 -Third of four films of Dan Dailey and Betty Grable. 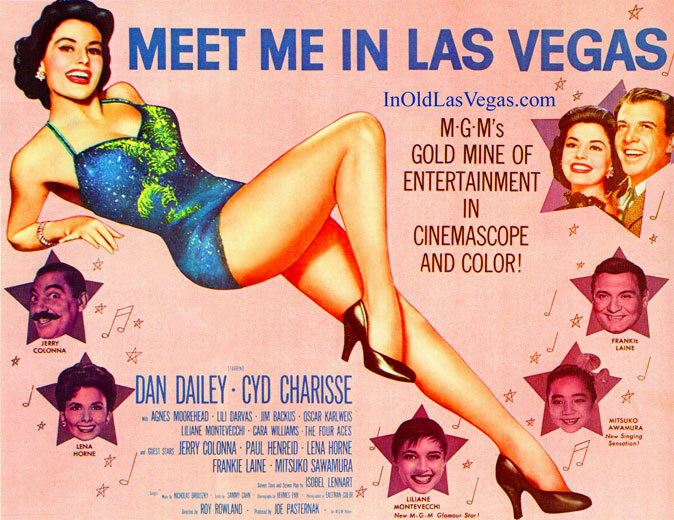 The others were “Mother Wore Tights” (1947), “When My Baby Smiles at Me” (1948) and “Call Me Mister” (1951). -Montage dancing shots of Dailey and Grable are numbers edited from “Mother Wore Tights” (1947). -Ranked No. 10 in the top grossing films of 1950. -“Don’t Rock the Boat, Dear” number. 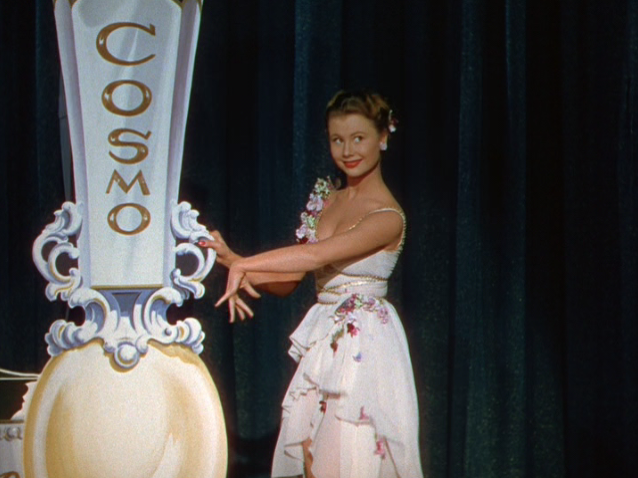 -Mitzi Gaynor in her first feature role. 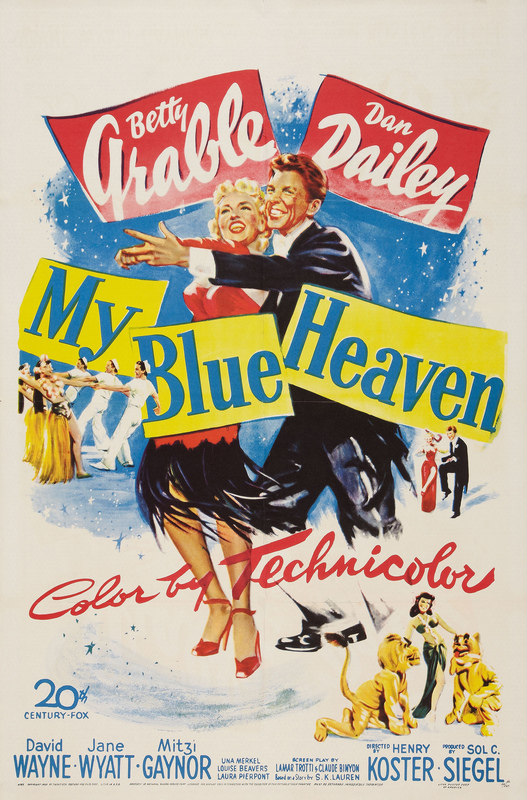 “My Blue Heaven” is a sweet, adorable and emotional little musical. Two performers learn they won’t be able to have children after having a miscarriage, and try to adopt. However, this is during a time that it was difficult for performers to adopt children, because they seemed unreliable due unconventional work schedules and were more apt to divorce. In the old fashion of her other films, Betty Grable shows off her beautiful legs and sells a song better than anyone else can. 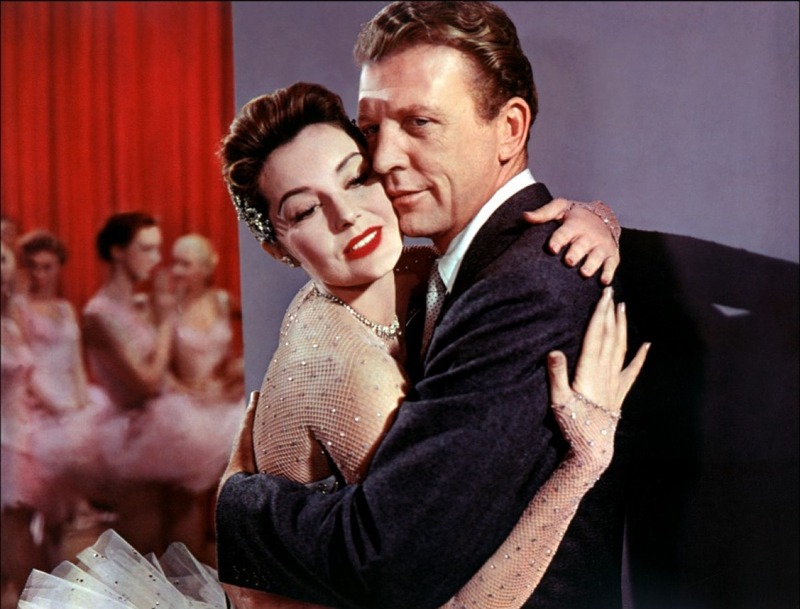 However, it also gives both Grable and Dan Dailey the opportunity to give an emotionally charged performance. Grable shows her elation of pregnancy, and her despair when she loses a baby and as she struggles to adopt a child. Along with their performances in this film, Grable and Dailey also are an underrated screen team. Starring in four films together, their chemistry is always through the roof. 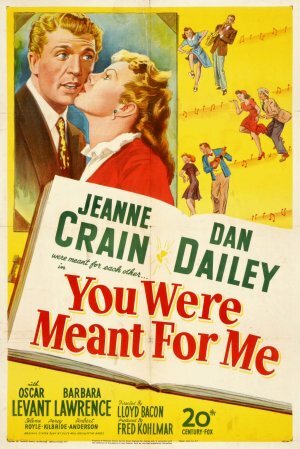 -As shown in other films such as “Close to My Heart” (1951) and “Blossoms in the Dust” (1941), adopting or promoting adoption was taboo during this time, because parents wouldn’t know what sort of background these “foundlings” came from. However, “My Blue Heaven” doesn’t really focus on that aspect. -The lead characters are television stars at a time that TV was a large threat to films (and still is). It’s also fun to see Mitzi Gaynor in her first film role playing a not so savory woman. My Blue Heaven is heartwarming; making me smile at one point and tear up at the next. Out of work vaudeville star Frankie Merriweather (Morgan) is trying to break into radio. When Frankie gets his own radio show, he is immediately fired when he causes a panic with his “Battle of the Planets” when listeners think it is a newscast, because he bypassed the advertisements. Trying to figure out how to get back into his career and pay alimony to three ex-wives, Frankie gets his children (Grey, Lynn, Nunn) into the act. -Frank Morgan does “impressions” of Robert Taylor, Mickey Rooney, Hedy Lamarr on the phone, and Claudette Colbert, Clark Gable and Spencer Tracey in a a scene from “Boomtown.” The “Boomtown” impression is straight from the film. Mickey Rooney and Hedy Lamarr sound like they are not the real actors doing the voice over. Frank Morgan has to earn money to pay alimony to three wives. 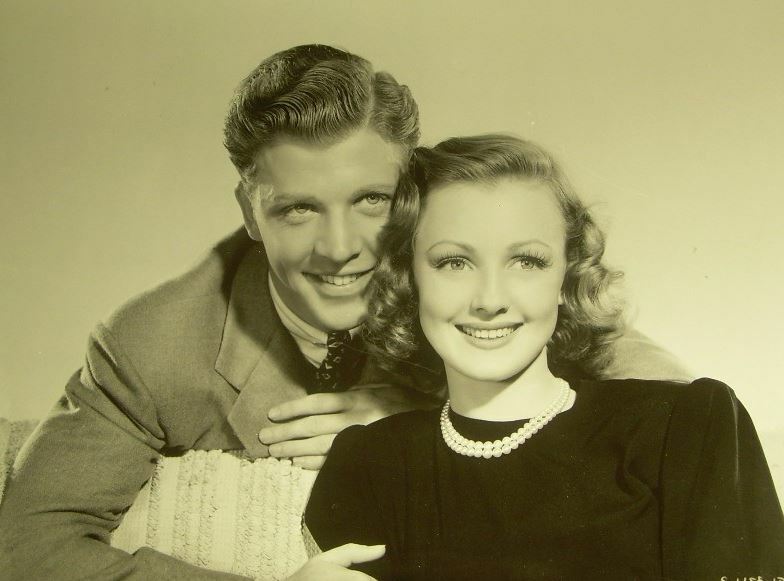 Dan Dailey and Virginia Grey in “Hullabaloo” (1940). However, the studio also cranked out several B-level musicals, that are equally entertaining. “Hullabaloo” is an example of one of those lower budget musicals. Frank Morgan and Virginia Grey are the leads in this film, and while they were famous and appeared in several films, they generally were supporting roles in larger budget MGM movies. While the movie’s plot is about actors trying to break into radio, it gives an interesting glimpse into entertainment history. The radio is seen as an “economic salvation” for struggling vaudeville stars as they transition their careers, according to “Radio in the Movies: A History and Filmography, 1926-2010” By Laurence Etling. Radio was another outlet for vaudeville stars to keep performing as that medium of entertainment faded. There are also a few notable things about this 78 minute film. First, just a couple of years after Orson Welles’s 1938 broadcast “The War of the Worlds,” “Hullabaloo” spoofs the panic that Welle’s radio broadcast caused. I thought it was interesting just because it showed how “War of the Worlds” impacted pop culture- even then- enough to joke about. I could be wrong, but I feel like could be comparative to jokes in the media about current celebrities. 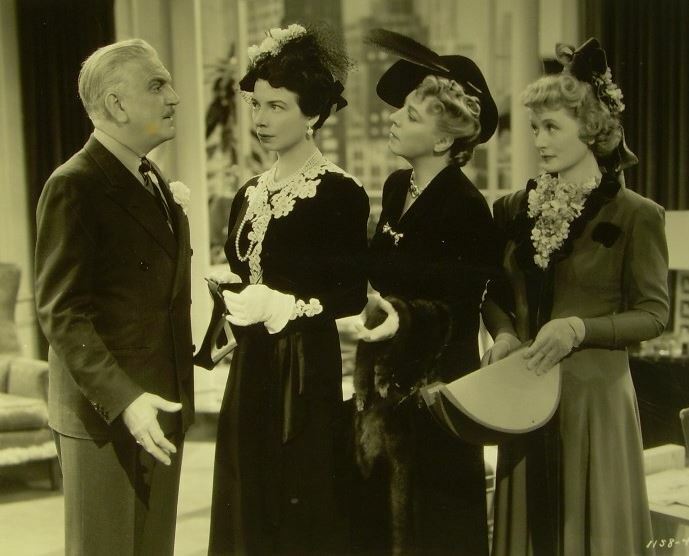 Another highlight in the film are Frank Morgan’s “celebrity impressions.” Obviously…Morgan is not actually doing the impressions- most of them sound like the real actor speaking – but it’s so ridiculous to see that it’s humorous. But for me, the true highlight was Virginia O’Brien’s first credited on-screen role. The frozen-faced singer pops on screen for two musical performances. 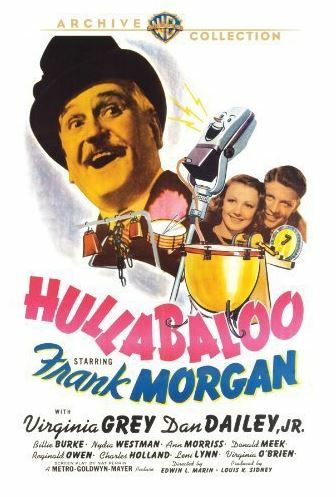 Though it’s a very silly film, if you have a little over an hour to spare, “Hullabaloo,” isn’t a bad way to spend it.